Yosemite National Park was originally inhabited by the Ahwahneechee tribe, before the gold rush brought non-native settlers to the area. Now it is a wildlife preserve with many activities for families to enjoy. Camping, backpacking, fishing, and many other activities are available. See the luscious waterfalls or famous Giant Sequoias. Yosemite even has a free photographer’s tour and is home to the Ansel Adams Gallery, which displays work by its namesake as well as several other artists. Rainbow Bridge was a sacred area for the Pueblo people. Located within the canyons surrounding Navajo Mountain, this is one of the largest known natural bridges. The Paiute and Navajo tribes called the land mass “Nonnezoshe,” which means “rainbow turned to stone.” It is now a protected national monument. Located in south-central Oklahoma, Chickasaw Country has gorgeous amenities. Originally calling areas through Mississippi to Tennessee home, the Chickasaw people migrated to Oklahoma in the 1800s. The Chickasaw are one of the Five Civilized Tribes who have their own governing bodies. The Chickasaw region is home to gorgeous views and many modern amenities, including resorts and casinos, many of which are showcased online at ChickasawCountry.com. The Chickasaw National Museum holds the tribe’s history and art; it is located at the entrance to the Chickasaw National Recreation Area, the only national park formed at the request of a Native American tribe. Badlands National Park was originally inhabited by the Lakota tribe, members of the Great Sioux Nation, who were part of the historic Battle at Wounded Knee. The Badlands offer some of the most glorious vistas. You can visit Badlands Wall or travel the scenic Loop Road, but the most popular activity may be the archaeological digs where you can really explore the history of the area. Thought to be over 1000 years old, the pueblos are made almost entirely of adobe and belong to the Taos tribe. This multi-story housing, houses 150 Taos natives to this day, with many other tribe members living nearby in more modern homes. These beautiful homes located in northern New Mexico are now a national historical landmark. Devil’s Tower bears significant historical ties for many area tribes including the Arapaho, Crow, Lakota, Cheyenne, Kiowa, and Shoshone tribes. Vision quests, funerals, and prayer offerings were all conducted at this historical site. Native folklore states that the notable texture of the formation was created by giant Grizzlies clawing at the rock. 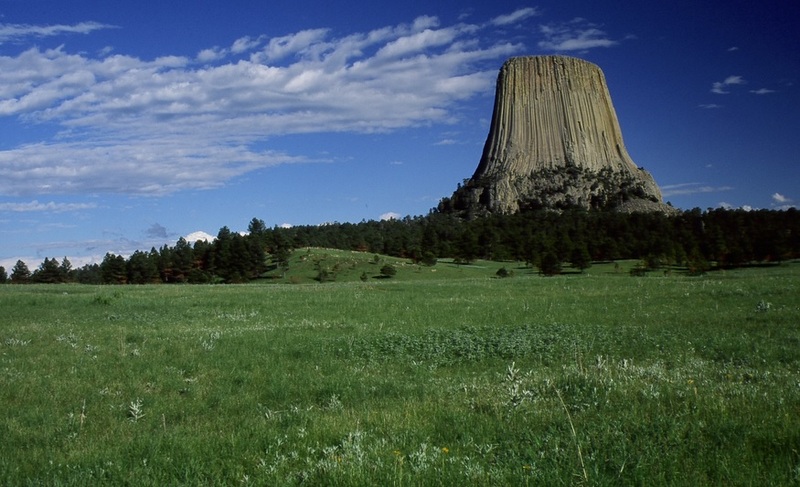 In 1906, President Theodore Roosevelt declared Devil’s Tower the very first national monument. Originally home to the Blackfeet, Salish, and Kootenai tribes, settlers came to the area seeking animal hides and pelts. The natives once hunted the Grizzly, bison, and beavers that inhabit the area. Glacier National Park is known for its incredible mountain views and glaciers. Originally the park contained 150 glaciers but that number has diminished to a mere 25, most of which are small remnants of what they once were. Scientists predict the few remaining glaciers will disappear within the next several decades. Located along Beaver Creek, Montezuma Castle is a 800-year-old cave dwelling. Built into a limestone cliff, it is one of the most well-preserved cliff dwellings in existence. It was inhabited by the Sinagua tribe for 300 years before becoming a national monument. This attraction is located within the Puget Sound area of Seattle and is only accessible by boat. On Blake Island, where Chief Seattle was born, you can experience clam nectar and traditional alder-fired salmon or venison stew, foods that are native to the area tribes. Dinner is served in a traditional longhouse and accompanied by storytelling and dancing, featuring traditional wooden Pacific Northwest tribal masks and attire. Bring the family and discover the history of America. Whether by car or plane, it is worth the trip to visit these amazing sites.